Ok early new years resolution….update the blog more regularly…..watch this space! So to start off, a quick update on the land sales, I can confirm that the first lot (top of Pitch Hill) has been completed, and has been sold to a local resident. Once all the lots have been sold and completed, probably in the next couple of months, we will update everyone of any changes to access, though we all hope it remains as things are. 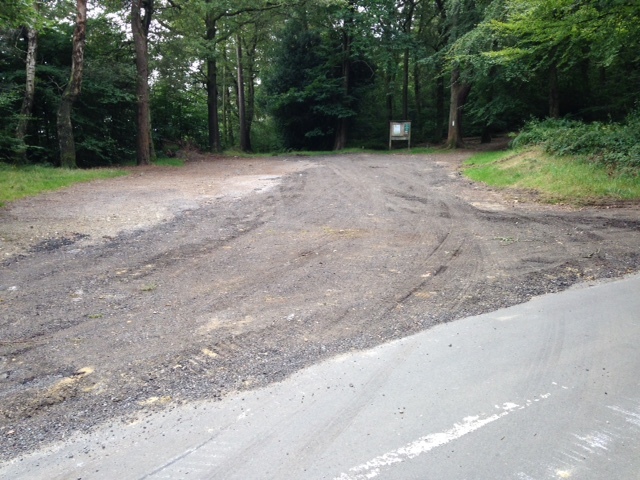 Meanwhile we’ve been busy on Holmbury Hill at car park No.1, giving it a bit of a haircut as the view was becoming a bit overgrown. I know a lot of our less mobile visitors, like to park on the top part of the car park and look at the view from their cars or the benches in front. Speaking of benches, we will be replacing the one that has been vandalised as soon as I come across a nice lump of hardwood to replce the seat. Further over the hill at the junction known as ‘Fiveways’, a not very imaginative name for a junction of five ways, we’ve been clearing the sightlines. It’s a fairly major junction, and I’d noticed that poor visibility was starting to become an issue. 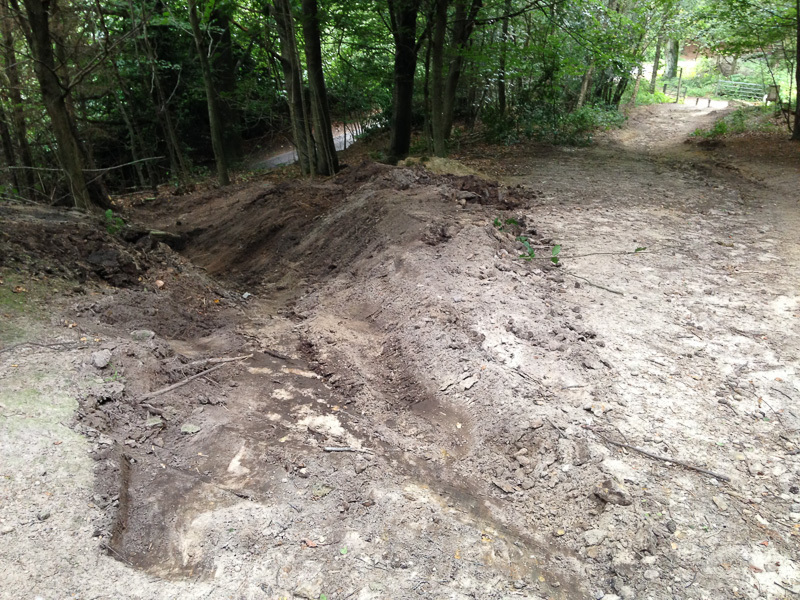 My main concern was mountain bikers travelling at speed coming into contact with other users. On the whole, I think its now fair to say that the vast majority of bikers who are familiar with the Hurtwood, know that they can come across other users at any time, and tend to ride accordingly. However there’s still a few that think riding as fast as they can, at all times, is the norm. As a couple of bike trails start and finish near to the junction, it can get quite busy, so to give everyone as much sight as possible, it did need a bit of a cut back. This is nothing new and something we do on lots of other trails, to increase lines of sight as much as we can. Hopefully this picture explains it a little. 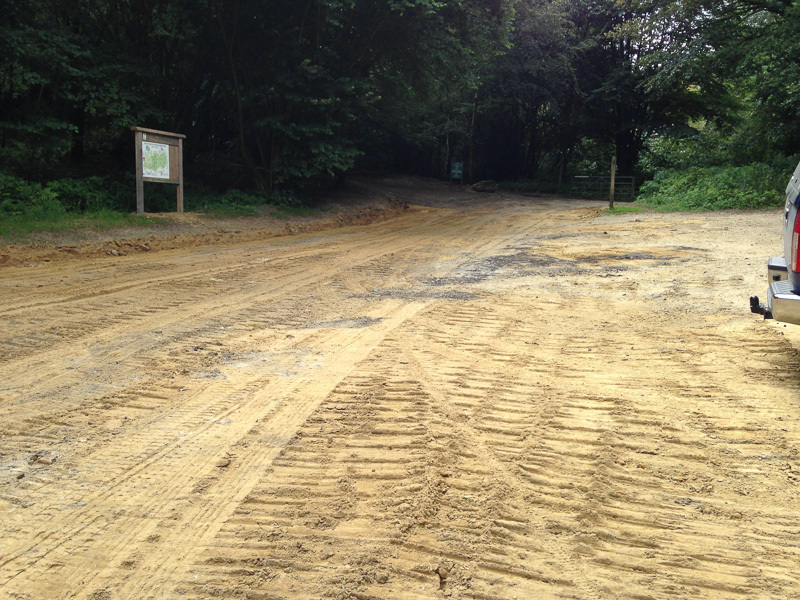 Logging on Winterfold is nearly finished and we are hoping to have the carpark open again by the second week of January, that’s assuming it doesn’t need re-surfacing first. 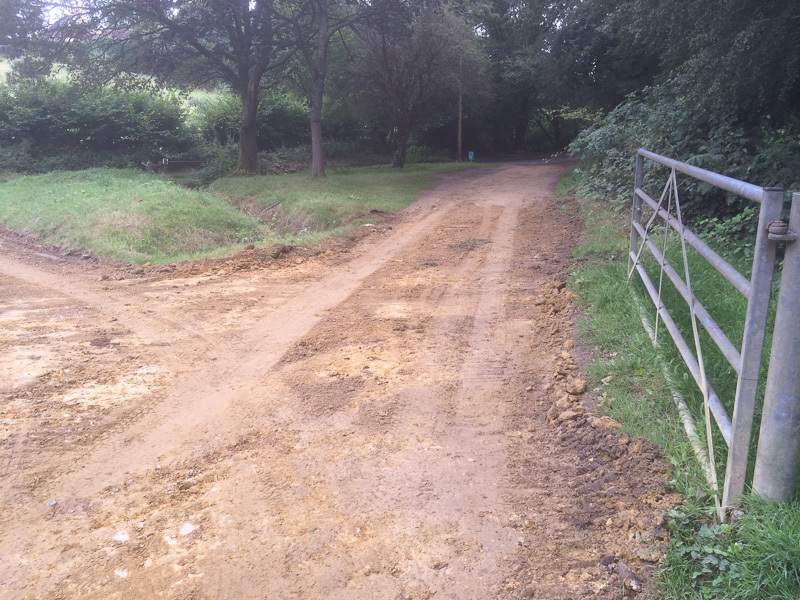 Some of you may have seen or heard the news about Shere Manor Estate having to sell part of The Hurtwood. As you can imagine something like this often raises many questions and rumours, and as I’ve already had to answer quite a few of those questions and heard quite a few of the rumours, I thought it wise to try and give you as much information as I can. 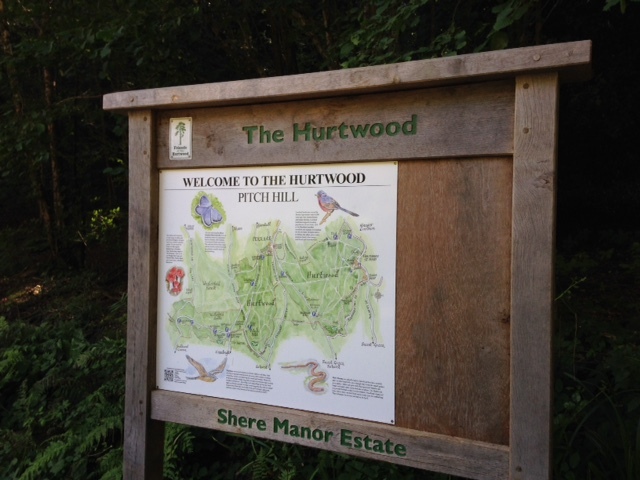 As you many of you already know, The Hurtwood is all privately owned by four landowners, with Shere Manor Estate owning the majority and who now need to raise a substantial amount of money. 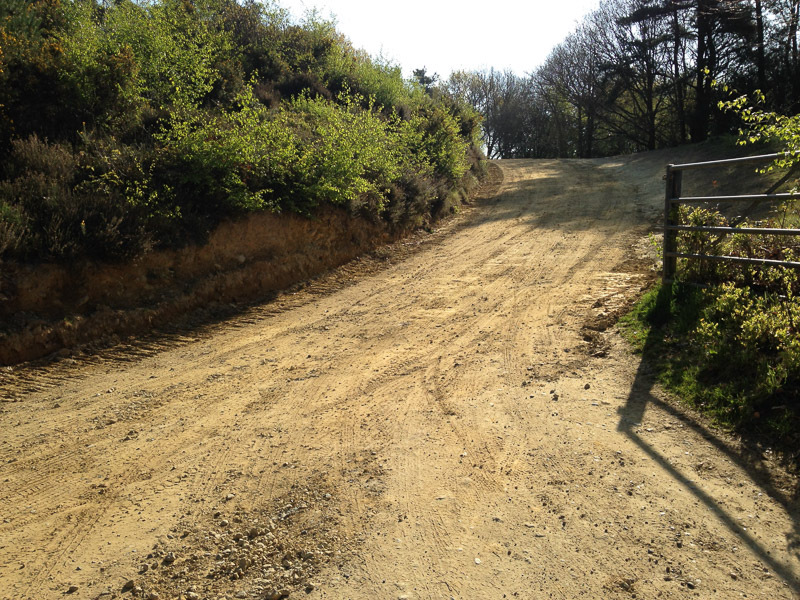 The areas that are for sale are, all of Pitch Hill, Bentley Copse, the eastern part of Winterfold, Shere Heath and part of Holmbury Hill between the Ewhurst road and Radnor Road, (where the bike trail BKB is), in total around 800 acres. Currently, you all enjoy access on foot, horse and bike on nearly all of the area, this is because of the original Deed of Dedication of 1926, but now if the land changes ownership, the new landowner is not obliged to honour that original deed. However, the land will then come under the Countryside and Rights of Way Act 2000 (CROW). This Act allows access on foot to remain exactly as it is now, though any new landowner would not be obliged to maintain any of the non-statutory paths, only the actual Rights of way as seen on a Ordnance survey map, for instance, but technically you could still walk all over the area. The CROW Act does not provide access for horse riders and bikers, this would purely be down to the discretion of the new land owner. Bikes and Horses would however still be allowed on the statuary network of Bridleways. 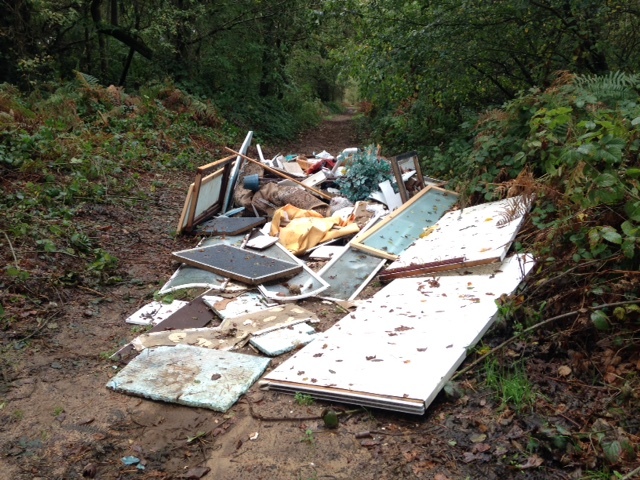 Currently it’s business as usual, and we’ll just have to wait and see who the new landowner is and hopefully they will carry on allowing us to maintain the access agreements as they are and no-one will notice the change, (as has happened recently on Winterfold Heath and the western part of Winterfold). I’ll update this blog as and when we know any more. 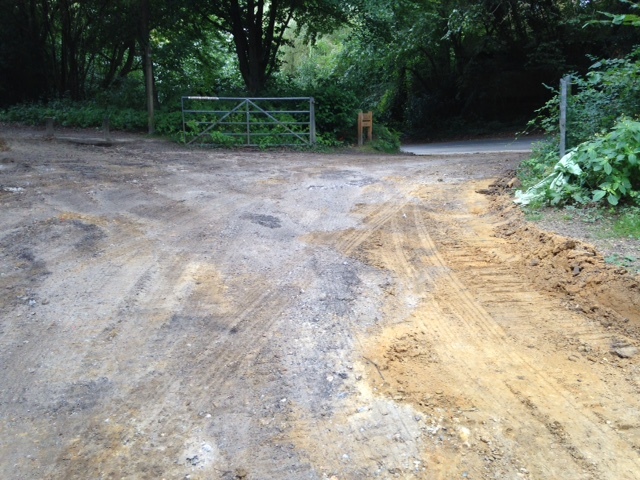 We’ve now completed the scheduled works to repair the worst of the problems in the car parks. 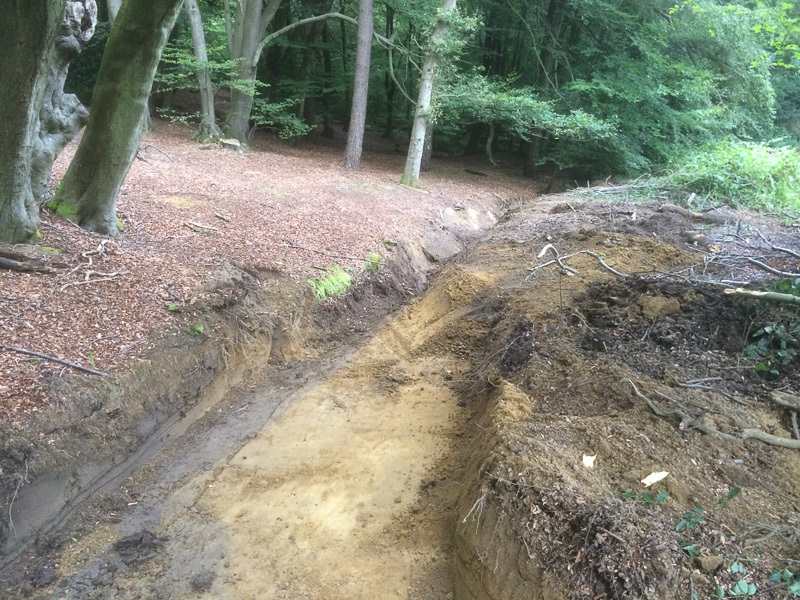 This work has been funded by a Forestry Commission grant designed to enable and increase public access to woodlands. 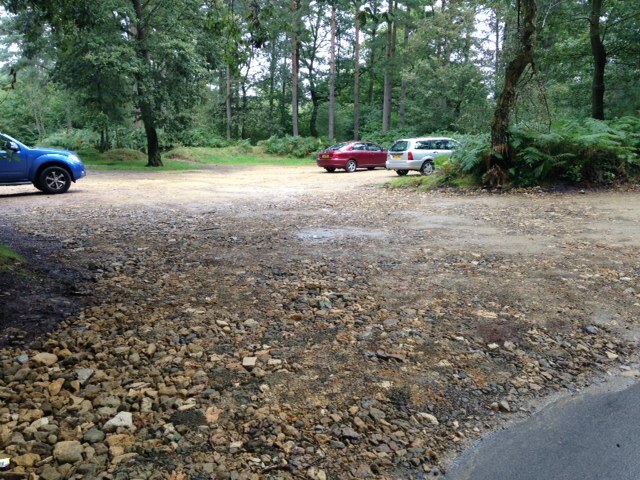 We will be doing some further work to Walking Bottom car park as soon as the weather starts to warm up. Previous experience has shown that if we lay the surface and before it has a chance to settle then freezes, it tends to break up very quickly. Whilst we were there with the large Digger, Martin Nicholson did a bit of drainage work too, clearing out some ditches around the edges to aid the water run off. 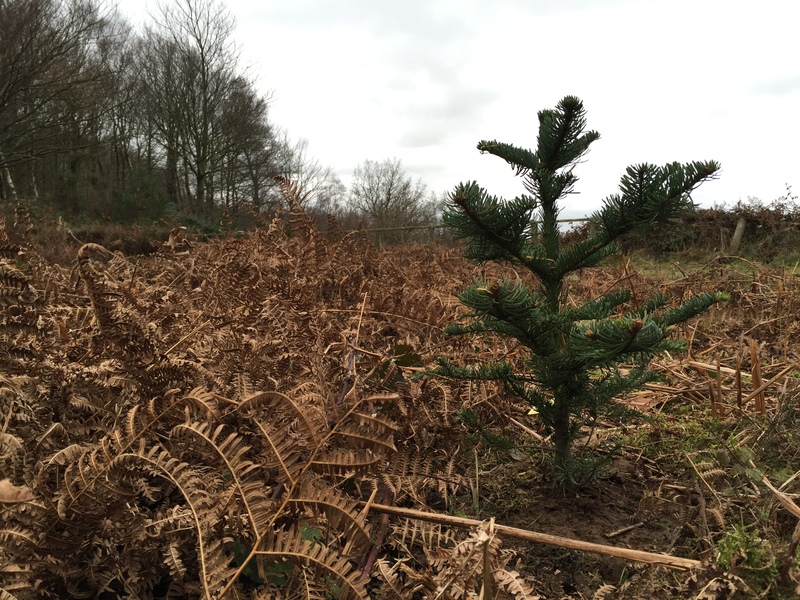 If you’ve noticed the small Noble Fir saplings that were planted in the middle of the disabled access track on Holmbury Hill, these are in memory of Derek Barnet the woodman for Shere Manor Estate who had worked on the Hurtwood for over thirty years. After finding a nice bit of Oak that came down in the storms of December 2013, after cutting to approximate size it’s been drying out nicely in the old tractor shed in Holmbury. 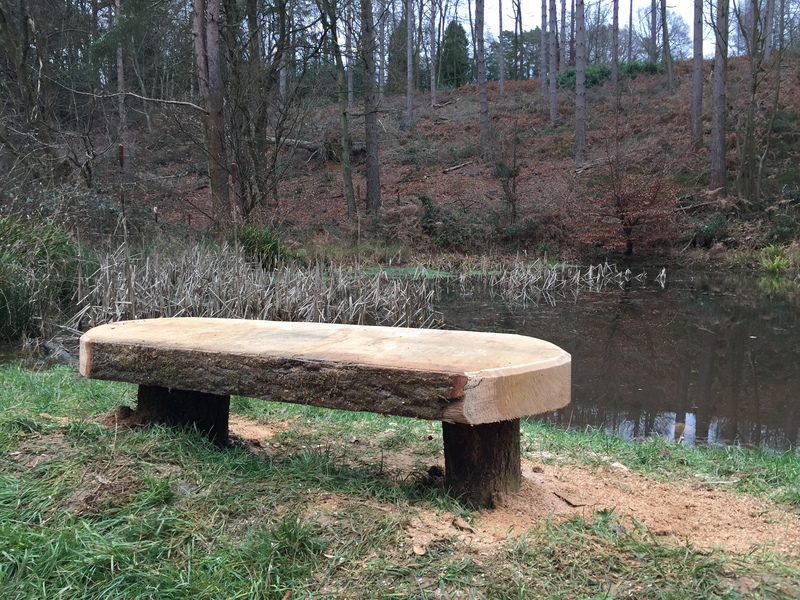 Now its become the replacement bench beside the pond at Walking Bottom after the old Ash bench unfortunately became unstable after being damaged by the forestry contractors. If I say so myself, I think it looks pretty good, enjoy! Over the summer. 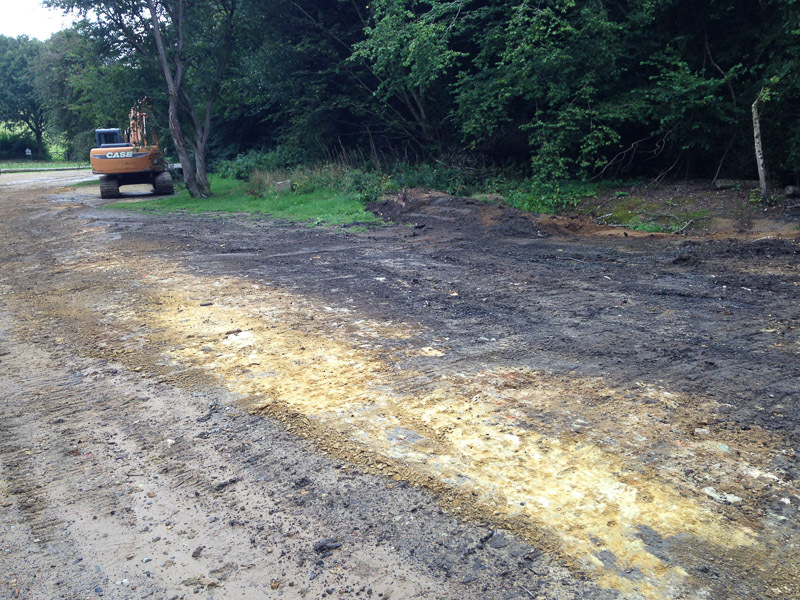 we’ve been having a bit of revamp in the carparks on the Hurtwood. 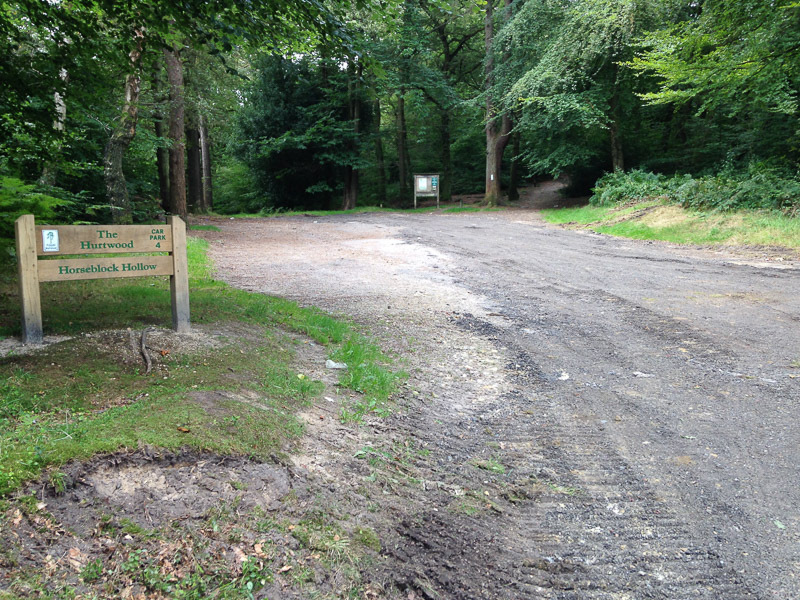 Hopefully if you visit you’ll have noticed the new entrance signs, made for us Norbury Park Sawmill, as well as a few new notice boards to replace damaged old ones. The main new change is our lovely new maps. The previous maps were designed over 20 years ago, and quite out of date. 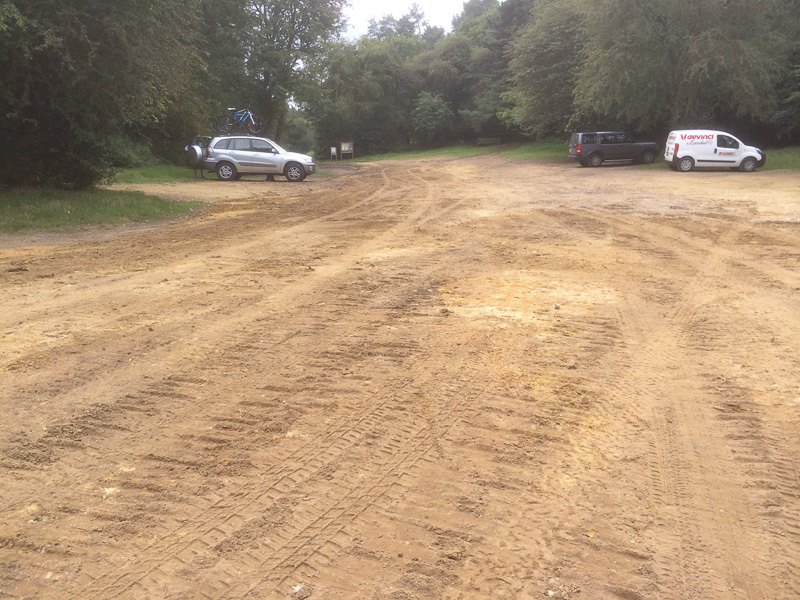 As part of ongoing maintenance we’ve also had work done on the car park surfaces to reduce the number of pot holes. It’s always going to be an ongoing battle when the carpaks have to deal with such a large quantity of water run off from the hills, as well as traffic, and I don’t think covering them in tarmac is ever going to be an option!